National Media Development Center (NMDC) in coordination with FNJ Sarlahi branch has organized fivedays Journalism Training Focused on Development Reporting. Department of Information, Ministry of Information and Communications had supported the program. It was 98th journalism training of NMDC. 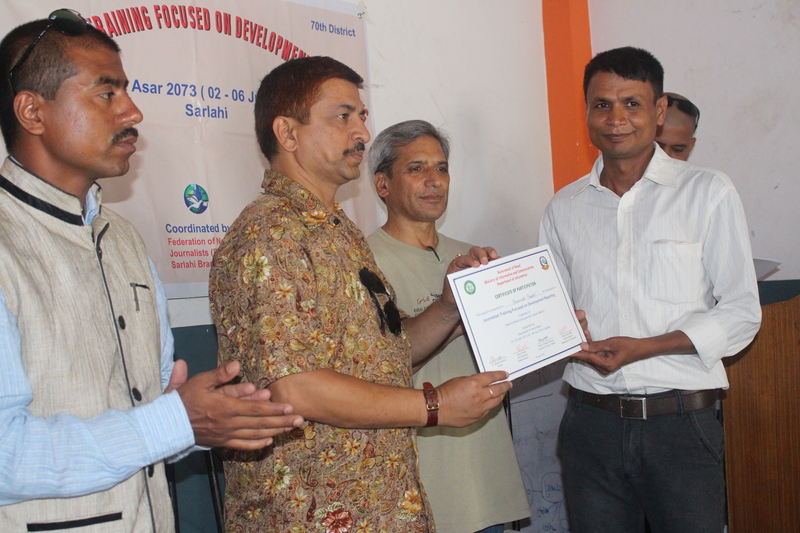 Together with Sarlahi, NMDC has organized its different theme based trainings in 70 out of 75 districts of Nepal. NMDC from its inception is devoted for the promotion of rural media in the country. So far, NMDC has provided different theme based trainings to 2346 participants. This training was organized from 02 -06 July 2016 (18 – 22 Asar 2073) at Lalbandi, Sarlahi. Journalism training focused on development reporting gave high priority to working journalists. There were 19 participants including 12 women journalists working in 9 FM Radio Stations, online and newspapers. Analyzing the need of the country, NMDC had designed this training to the working journalists focusing on development reporting. The training became fruitful to reporters and radio program presenters. For the first two days, the course covers the principles of basic journalism. Other contents included in the training were news identification, news writing, experience sharing, field reporting and presentation. The concept of development reporting and its need was also introduced from the beginning so that participants had become aware of identification of development issues at local level. Apart from principles of journalism and development journalism new media-Facebook, Flicker, Blog, Google search, Google mapmaker and code of conduct for the journalists were also discussed. Discussion also took place that the journalists has to be updated with district information based on district profile. Together with several class exercises, presentations and news writing practices, one field reporting assignment had provided a great practical knowledge to the reporters. They had told that the field reporting assignment had inspired and gave them a clear idea in collecting information and news writing. Even in a short period of time, they had become able to recognize and identify issues and had also become able to write news in structure. They also have learned beat reporting such as tourism, development and economy. Participants have become familiar with the code of ethics for journalists. Chief of Lalbandi municipality Shada Kumar Pokharel had jointly inaugurated the five-days training on 02 July 2016 at Lalbandi, Sarlahi. 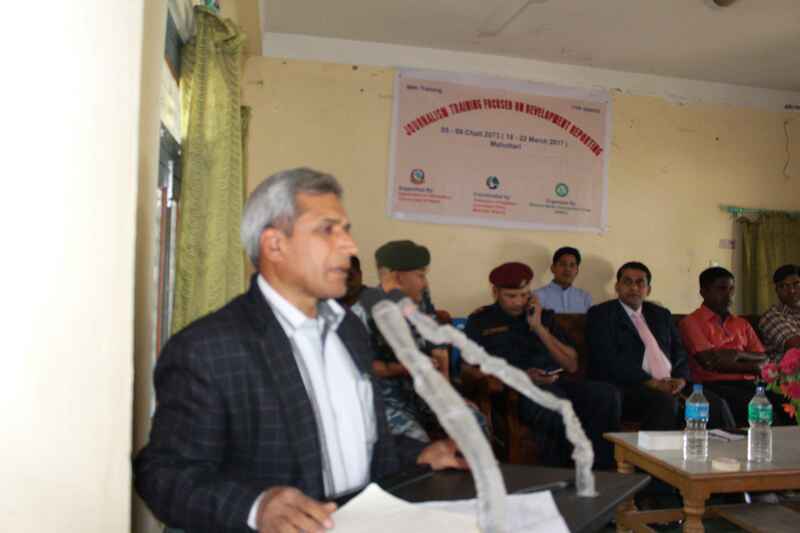 Inaugurating the session, Ranjit said, ” Special guest Shad kumar Pokhral Assistant Chief District Officer of Sarlahi inaugurating the training by reading the banner congratulated the participants to get benefit from the standard training organized for the first time in the district. He also asked the journalists to follow the code of conduct of journalists and encouraged them to give verified news. Special guest and Joint Secretary of Department of Information Bishnu Bhakta Ranjit was also present at the insugural session. Addressing the session he said, journalists should be familiar with the rules and regulation related with media. They should take press card provided by the Department of Information. He also asked the journalists to be professional. “Professional journalism has yet to be developed in the country though a long journey Nepali media has made. The role of the journalists should now be changed and it should lead by providing development issues”, addressing the session trainer Dr. Suresh Acharya said. 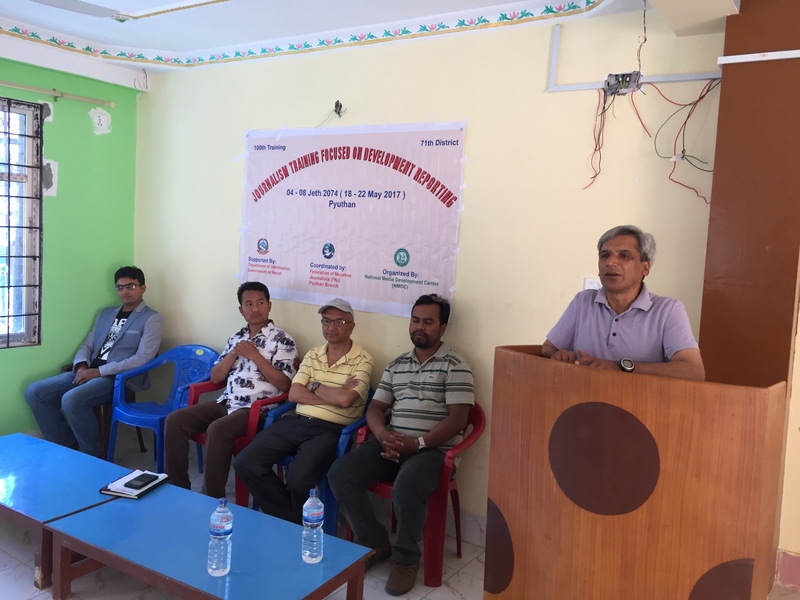 Vice-President of FNJ Sarlahi branch, Bishownath Thakur encouraging the participants said that the training is organized at the time of need in Sarlahi. He also said that local media have not so much paid attention on development issues. 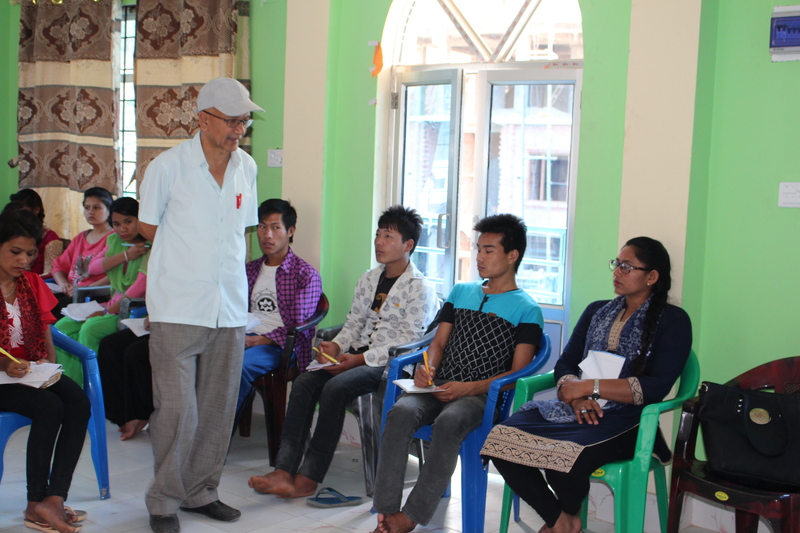 Expressing his expectation, he said this training will inspire the participants to raise development issues. He also thanked the organizer for bringing the valuable training in the district. It was the first development focused training organied in the district. Bishnu Prasad Sharma, Executive Director of NMDC welcoming on behalf of organizer, supporter and coordinator highlighted the content, objective of the five days training. At that time, he briefly informed the rural district focused training programs organized by NMDC. Vice-president of FNJ Sarlahi branch Bishownath Thakur had chaired the inaugural session. Dr. Suresh Acharya, Bishnu P Sharma and Bishnu Bhakta Ranjit had facilitated the five days training. NMDC had evaluated the training through pre and post training questionnaires by involving trainees. The concept they mentioned in the firm had shown that the training was successful to transfer basic skill to the participants. They become able to identify local development issues. At the end, a brief closing session had also been organized in participation with trainers, senior journalists, FNJ members and local journalists. Tank Chhetri had chaired the closing sessions. They learned that to be a professional reporter, they should be aware of code of ethics. 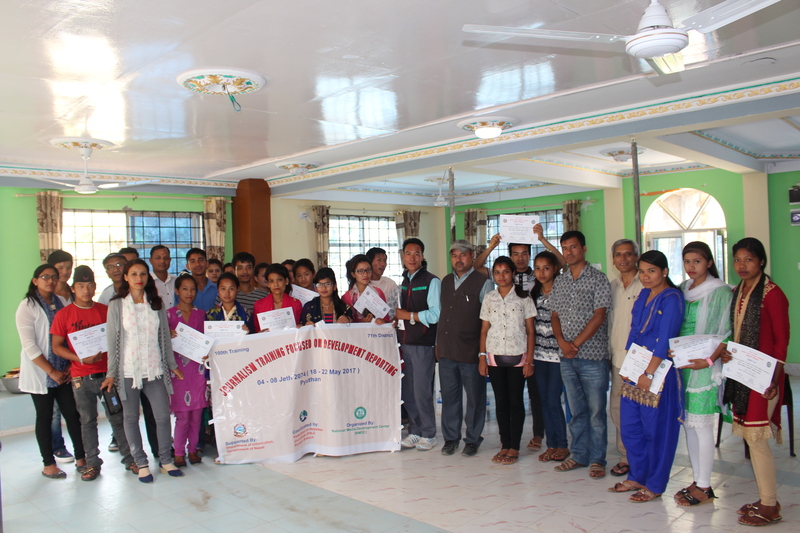 National Media Development Center (NMDC) with the support from the Department of Information, Ministry of Information and Communications and in coordination with FNJ Pyuthan branch has successfully organized a five-day Journalism Training Focused on Development Reporting. It is NMDC organized 100th journalism training that was organized from 18-22 May 2017, (04 – 08 Jeth 2074) in Pyuthan. NMDC has organized its different trainings in 71 out of 75 districts of Nepal.So far NMDC has provided journalism skill to 2398 participants including 1061 women. Journalism training focused on development reporting gave high priority to fresh participants. There were 27 participants including 17 women. Among them 9 were working journalists who had participated in previous journalism training and all others were new participants interested in journalism. At the end of the training, all of them expressed their interest to be a media reporter. There are 7 FM radio stations, and 16 newspapers in the district. The training became fruitful to all the new participants as they clearly understood the theme of the training and they participated very actively in all sessions. For the first two days, the course covered the principles of basic journalism, news identification, news writing, experience sharing, field reporting and presentation together with the concept of development reporting. In other days, it focused on writing skill, interview skill, and other dimensions of development reporting. The issues apart from principles covered in the sessions were new media-Facebook, Flicker, Blog, Google search, Google mapmaker, development, tourism, culture and economic reporting and code of conduct for the journalists. Discussion also took place that the journalists had to be updated with district information. FNJ President Mahabir Rana Magar had chaired the inaugural session. Inaugurating the training session, he welcomed the trainers and participants and asked them to take maximum benefit from the senior trainers, which is rarely available. He said, the participants were very lucky to have this training. He encouraged them to learn being active and become good reporter. Senior trainer Shreeram Singh Basnet addressing the session said that the training would be based on practice so they had to participate actively in all sessions. To make the training fruitful they should participate in a friendly environment. Shreeram Singh Basnet, Bishnu P Sharma, Giru Prasad Bhandari, Laxman Acharya and Bijaya Bharati had facilitated the training. Senior journalists and trainers jointly distributed the certificates to the trainees. Puja Bhusal and Lil Bahadur Roka Magar had expressed their training experience. Both of them said that the training had developed their confidence and encouraged them to be good journalists. National Media Development Center (NMDC) in coordination with FNJ Mahottari branch has successfully organized a five-day Journalism Training Focused on Development Reporting. Department of Information, Ministry of Information and Communications had supported the program. It was 99th journalism training organized by NMDC. 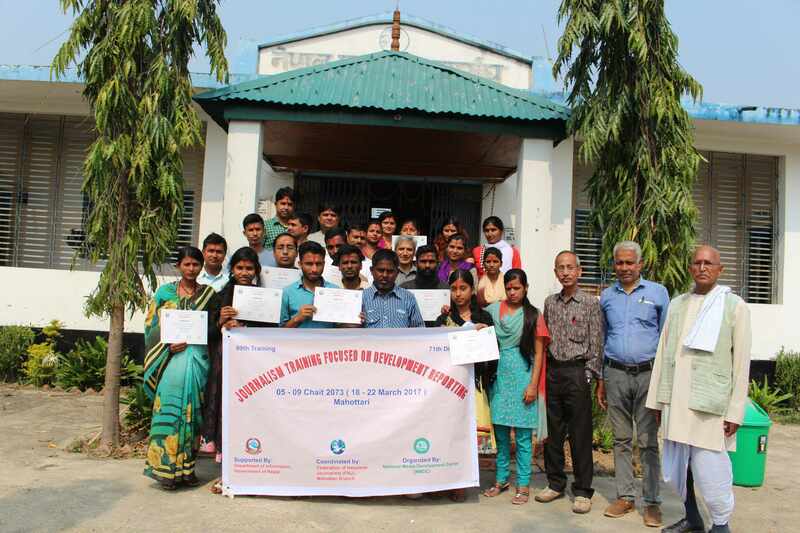 Together with Mahottari, NMDC has organized its different trainings in 71 out of 75 districts of Nepal. The training was organized from 18-22 March 2017 (05 – 09 Chait 2073) at Mahottari distrist. Journalism training focused on development reporting gave high priority to fresh participants. There were 24 participants including 13 women. There were only 5 working journalists and all others were new participants interested in journalism. At the end of the training, all of them expressed their interest to be a media reporter. There are 9 FM radio stations, two daily and seven weekly newspapers in the district. The five days training was designed to the new as well as working journalists focusing on development reporting. NMDC focuses on development issues rather than that the reporters raise only in political issues. The training became fruitful to all new participants as they clearly understood the theme of the training and they participated very actively in all sessions. For the first two days, the course covered the principles of basic journalism, news identification, news writing, experience sharing, field reporting and presentation together with the concept of development reporting. In other days it focused on writing skill, interview skill, and other dimensions of development reporting. The issues apart from principles covered in the sessions were new media-Facebook, Flicker, Blog, Google search, Google mapmaker, development and economic reporting and code of conduct for the journalists. Discussion also took place that the journalists had to be updated with district information. Together with several class exercises, presentation and news writing one field reporting assignment had provided a great practical knowledge to the reporters. They had told that the field reporting assignment had inspired and gave them a clear idea to be a reporter. Even in a short period of time, they had become able to recognize and identify issues and had also become able to categorize issues on different themes such as tourism, development and economy. They also have learned that journalists should keep in mind the code of ethics for journalists. to bring the leader’s speech daily if there is not any new and reliable information. Media should focus on economic development,”addressing the session trainer Pramod Pradhan said. 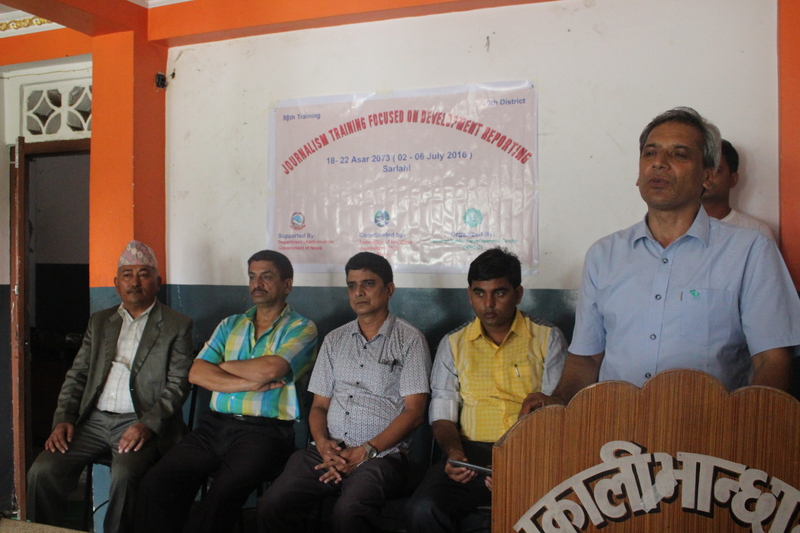 Vice-President of FNJ Nagendra Kumar had welcomed the participants. Bishnu Prasad Sharma, Executive Director of NMDC welcoming on behalf of organizer, Department of Information and FNJ had highlighted the content, objective of the five days training. At that time, he briefly informed the rural district focused training programs organized by NMDC. FNJ President Kamalesh Mandal had chaired the inaugural session. Pramod Pradhan, Bishnu P Sharma, Mahesh Das and Mishrilal Yadav had facilitated the training.NMDC had evaluated the training through pre and post training questionnaires by involving trainees. The concept they mentioned in the firm had shown that the training was successful to transfer basic skill to the participants. In five days there were 30 different sessions. At the end, a brief closing session had also been organized in participation with senior journalists, FNJ members, local journalists. FNJ President had chaired the session. Senior journalists and trainers jointly distributed the certificates to the trainees. Rupesh Pandey and Puja Ray had expressed their training experience. Both of them said that the training had developed their confidence and encourage them to be a good journalists. They learned that to be a professional reporter, they should always follow the truth.